When the world’s leading companies and organizations contact us needing to safely store hazardous materials, their needs are never the same. The amount of space they have to work with, containers of chemicals being stored, and safety regulations guiding them are always unique. One constant: the unparalleled service and support our experienced engineers provide while constructing a building custom tailored to their needs. Over the last 30 years US Chemical Storage has forged their reputation, through 1000’s of satisfied clients, as the leader in fully custom and compliant hazardous material storage. Every square inch of our combined 195,000 sq. 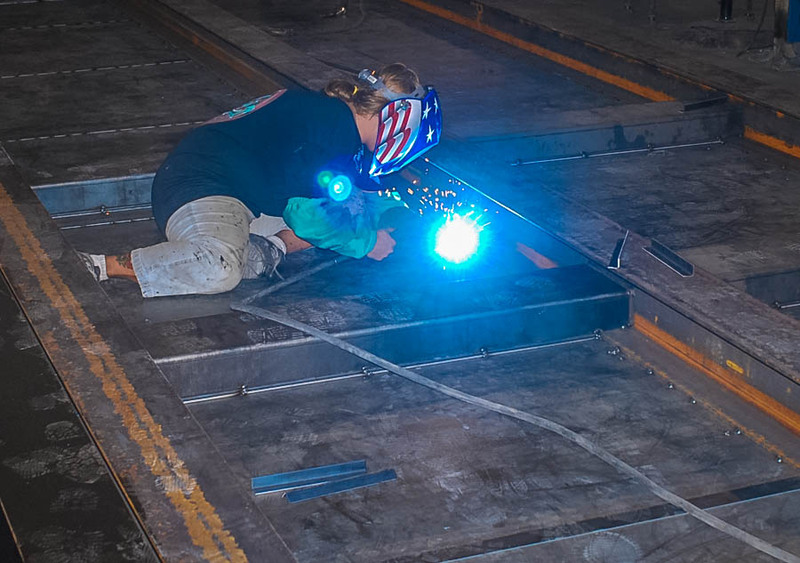 ft. of factory space is devoted to creating a hand-welded building that fits your exact specifications. Our wide variety of storage options are 100% compliant and guaranteed everyday day of our industry-leading 15 Year Structural Warranty. We focus on reducing the time you have to invest in gaining approval for and installing your unit. All of our chemical storage buildings and accessories are FM Global or Warnock Hersey pre-approved. Each unit is delivered to you ready for use on day one with structural attachments added on to improve forklift/crane access. 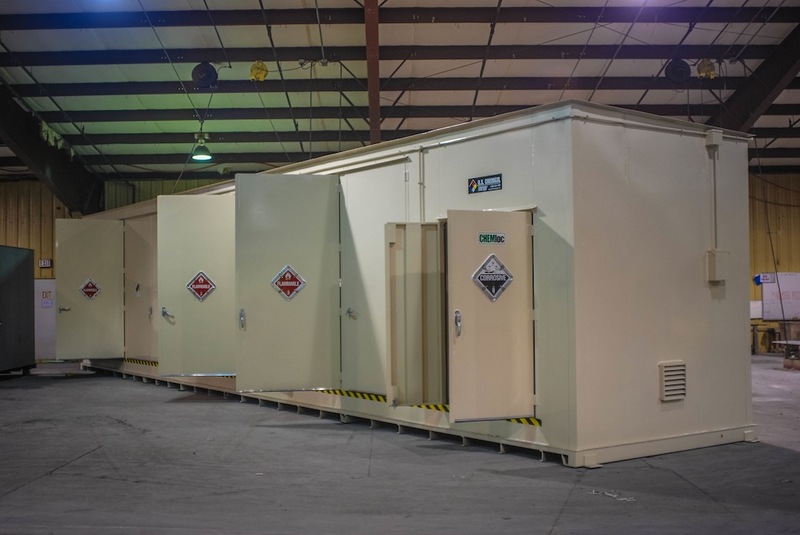 US Chemical Storage offers a number of different hazmat types and sizes— 5'x5' containers to modular 30‘x50’ or larger buildings are all possible depending on your needs. Fire rated, explosion proof, secondary containment, and all of our chemical storage accessories can be expanded or contracted to fit your needs. Our standard metal and drop-over chemical storage building widths are 6', 8', 10', and 12', with lengths ranging from 6'-52'. Standard Duplex Modular section width is 7’3”. This is compliant with DOT regulations and are attached to one another on-site, allowing for vastly increased floor-space in your building. Duplex storage buildings offer larger widths ranging from 15’-30’ depending on your requirements. Final factory inspection of chemical storage buildings shall be performed by US Chemical Quality and Control Team. Our quality control inspection and test forms shall be filled in, signed off, and made available for the Customer upon demand. A final copy of inspection and test are scanned and hard copy stored in a permanent US Chemical Factory File. Crane off loading (Spreader bars will be necessary) or forklift off-loading. Foundation Design, concrete pad and Site location for your US Chemical Storage freestanding building(s), loading ramps, electrical transformer (if required), anchor bolts, fasteners, shims for a complete installation. Electrical power connections, including but not limited to, electrical wiring, conduit, supports, knock down transformer with local disconnect switch. Building distribution panel is rated 120/240 VAC unless noted otherwise. Single phase for 60 or 100 amp service unless noted or ordered otherwise. Third party approval for US Chemical Storage Building(s) is designed for storage and dispensing flammable liquids as defined by NFPA 30. US Chemical Storage, LLC maintain Factory Mutual and Warnock Hersey Approvals and labeling privileges by maintaining a strict quality assurance program and satisfactory field experience. Both FM Warnock Hersey inspection agents conduct quarterly unannounced factory audits to inspect production and review quality assurance programs and documentation in great detail. The Factory Mutual label will be located on or near the front door. The Warnock Hersey label will be located on a data plate inside the building. Each customer is to verify with local AHJ if other third party approvals are required. NFPA 704 Sign Rating Decal, DOT Flip Chart Placards and a decal with Factory Mutual (FM) (if required) approved mark will be provided on or near the door of building. Model numbers, storage capacity, fire rating and location shall be provided inside the Chemical Storage Building. Documentation and quality assurance will be provided as an option in the form of As-Built Drawings. Operation Maintenance and Component Data Manuals will also be provided. Customers shall be permitted inspection visits at our manufacturing plant in Wilkesboro, NC at any time during on-going fabrication prior to, during, and after completion at reasonable times to be mutually determined. US Chemical Storage LLC shall fix or replace any part of the building, components, or systems found to be unacceptable during the shop test and inspections.